The Kitchen By Devin Davis is family run food truck started by Devin Davis, a native of Plant City Florida. The Davis family serves the Plant City and Tampa Bay area with a passionate southern spirit. Devin started his food career in culinary school where he obtained his Bachelors in Culinary Management. After completing an internship Devin sought out a way to bring his food to the people of Plant City. In the beginning stages of his culinary career he sought out positions in the area but never really found a position that fit him to the T, he had to start thinking outside of the box. And what's better then owning your own portable kitchen to drive around the city? Nothing! The Kitchen by Devin Davis was born. The food truck idea was inspired by his parents introducing Devin to the food truck industry and Tampa Bay Food Trucks. While Devin was and still is young with only a little bit of restaurant experience, he makes up for it with entrepreneur faith in his abilities. After doing their due diligence, Devin opened The Kitchen with the help of his family. So why "The Kitchen by Devin Davis"? When looking for a name, they started with a concept. Devin wanted to serve southern food done by his own interpretation. His food would come in a quality with a higher standard then typical street food fare. "Food Truck" was synonymous with "Kitchen" and Devin's passion for food and the basis of his career began and was cultivated in the kitchen. The Kitchen fit his concept perfectly. Devin is the master chef behind all of the food and works that come from his truck, so he included his name in the title. The Kitchen is based simply on cooking good food. Their slogan is "Good Food....Southern Roots". Whether The Kitchen is serving up fried chicken of foie gras, Devin makes it properly and delicious. Besides, good food makes people happy. Everyone that works on The Kitchen by Devin Davis is family. Whether it's by blood or close friendship, The Kitchen brings them all together. Some very important people on the truck include Devin Davis - the chef and mastermind himself, his Grandma (better known as Nanny) who plays an integral role in the cooking process, his sister, and parents. Devin found inspiration through his parents who own their own local small irrigation business in Plant City. They helped him begin and grow his business, and all together have helped The Kitchen succeed to what it is today. Wondering what's the best thing on the menu? The Kitchen by Devin Davis changes up their menu periodically to keep the menu fresh and allows The Kitchen to experiment and try new things. If there's one thing that stays on the menu - it's the fried chicken. This fried chicken isn't like any other fried chicken you've had it before. The Kitchen by Devin Davis goes through a two step process before even making it to the fryer. After getting crispy and juicy, it's served on a toasted bun with a bright red cabbage slaw and a remoulade sauce. A few of Devin's personal menu favorites include Shrimp and Grits, Bacon and Onion Jam Sliders, and Pulled Pork Tacos. The Shrimp and Grits combines tradition with unexpected flavors. 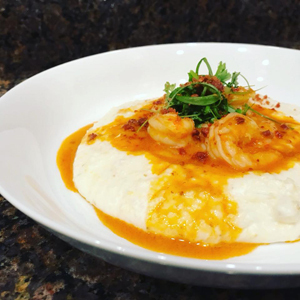 Smoky tomato and chorizo cream sauce, creamy grits, and parmesan are just a few elements to the shrimp and grits served up by The Kitchen. 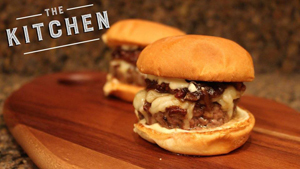 The bacon and onion jam sliders is a juicy burger topped with a salty and sweet bacon jam, caramelized red onions, red wine, white cheddar, and a dijon mustard mayonnaise. 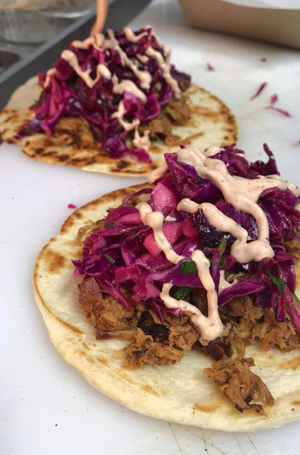 Last but not least, the pulled pork tacos are simple but delicious by combining juicy smoked pork with a sweet and savory rub on a toasted flour tortilla with a lime, cilantro slaw and spicy chipotle sour cream. The Kitchen by Devin Davis sets themselves apart from the competition by simply cooking great food. The menu is constantly fresh and exciting by introducing new items and changing the menu a bit every few weeks. They strive to use the highest quality ingredients possible by shopping at local farmers markets and utilizing things such as locally made sourdough. The Kitchen also loves a great challenge by working catered and private events where they can stray from the menu and offer unique foods that you can't find on the truck on a regular basis. When we asked Devin what's one piece of advice he'd give someone trying out food trucks for the first time he replied with "Just think of food trucks as you would restaurants. Each truck is different and really tries to put out great food. We all have different concepts and types of food. Additionally, I would encourage you try lots of different trucks to see what's out there. You can easily go out to a restaurant and try something new, but many people don't realize that you can go out and have just as much fun trying out a food truck, and the food will often be just as good, if not better, and you don't have to dress up!" Some food trucks Devin is close with include Sawadee Thai Food (Devin suggests the crab rangoon), Pineapple Shack, Chief's Chill Out, and the Rolling Gourmet. At the end of the day Devin's goal is to keeping doing what he does by sharing his passion for cooking and serving his customers delicious food. Interested in booking The Kitchen by Devin Davis for your next event? Call Tampa Bay Food Trucks! Whether you're interested in reception service for a wedding or to feed employees after a company wide meeting, we do all the work from booking the truck to booking music with our mobile DJ truck! Contact us here. Interested in following Devin Davis and the crew? Follow them on Facebook, and Instagram @thekitchenbydevindavis.